Whether you've heard about Stubby from the Internet, the upcoming animated movie, or other sources, you've come to the right place to learn the true story about this irresistible dog. Stubby's history is so captivating that it has spawned plenty of misinformation, but the facts themselves are even better than the fiction of any cartoon or caricature. This page introduces you to the real Stubby. • Stubby was not a sergeant in the U.S. Army. Despite what you may read or hear elsewhere, Stubby was never made a sergeant during his military service in France. No one addressed Stubby with a military rank during his lifetime. People just called him Stubby. Not a single historical clipping from Stubby's lifetime—and there are hundreds of them—ever referred to the famous dog with a military rank. Stories about his status as a sergeant sprang to life after Stubby wandered into the Internet. Stubby seems to have been "promoted" by his fans on the Internet. • Stubby was not a pit bull. The Internet seems to have spawned this rumor about Stubby, too, but nothing in the historical record supports the suggestion. In truth we can't be certain of Stubby's breeding—he was a stray dog, after all—but evidence suggests that he was related to early Boston terriers. Stubby appeared in dog shows for this still-evolving breed, and he was often reported to have been an American bull terrier, one of the early names for the new breed. Stubby has become a bit of a Rorschach test; one can look at him and see whatever pedigree one wants. His fans may argue about his parentage, but we still love's Stubby's story. That's what counts! • Stubby wasn't an official war dog. During the First World War, Germany, France, and Great Britain employed dogs in a robust program to carry messages, haul supplies, stand guard, assist medical crews, catch trench rats, and more. The United States military didn't develop its canine corps until the Second World War. Until then, dogs like Stubby served informally with American troops. • Stubby didn't belong to anyone (but he did have a best friend). Private J. Robert Conroy and Stubby met during the summer of 1917 while Conroy trained with other members of the 102nd Infantry Regiment on the campus of Yale University in New Haven, Connecticut. The two of them appear in a family photo taken shortly before this Yankee Division unit traveled to Europe, and later on Conroy recounted stories of how he helped Stubby join the deployment. The pair remained together until Stubby's death. • Stubby didn't earn those medals all by himself. 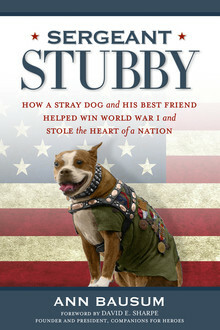 In time, Stubby became an official mascot for Conroy's company and served alongside the troops in France. During the summer of 1918, locals made the dog a military uniform, and, over time, it hung heavy with medals and other decorations. Conroy didn't contradict news reports about Stubby earning the medals, but almost certainly Conroy himself received most of them and simply shared them with Stubby. He credited his friend with getting him through the war, so he was happy to see Stubby share in the glory of their service. • The Smithsonian wasn't Stubby's first resting place. When Stubby died of natural causes in 1926, Robert Conroy arranged for his remains to be mounted by a taxidermist so future generations could still know Stubby. At first Conroy kept the mount and arranged for it to be displayed during reunions of war veterans and on other occasions. Then Stubby spent more than a dozen years at the American Red Cross Museum in the nation's capital before returning to Conroy's custody. The pair of friends survived a residential fire in 1954, and two years later Conroy donated Stubby to the Smithsonian Institution. The war dog spent many years in storage before becoming part of a permanent exhibition at the National Museum of American History in 2004. • Everyone forgot about Stubby's best friend. Or at least almost everyone forgot—even the Smithsonian Institution lost track of him—but his descendants still share stories they heard as children about their patriarch's companion during the First World War. Robert Conroy played the part of a good PR man when he spoke about Stubby in public, forever putting his friend's story forward and keeping quiet about his own. When he died in 1987, he passed along his favorite keepsakes about Stubby to his grandchildren. 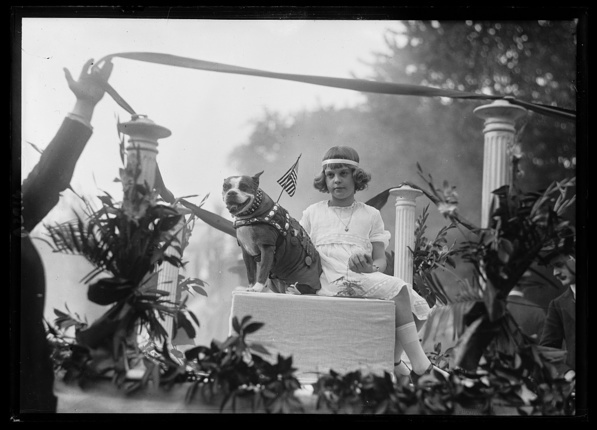 Stubby rode in a place of honor during a 1921 parade through Washington, D.C. Author Ann Bausum spent two years researching and writing about Stubby. Central to her work was the discovery of Conroy's descendants and reconnecting the threads of their stories with those maintained by the Smithsonian. Bausum's research became the foundation for twin titles that introduce readers of all ages to the story of Stubby and his best friend. Choose Sergeant Stubby if a shorter account with glossy photos stirs your fancy. This book can be read by people as young as elementary school-aged and as old as Robert Conroy was when he died at age 95 in 1987. 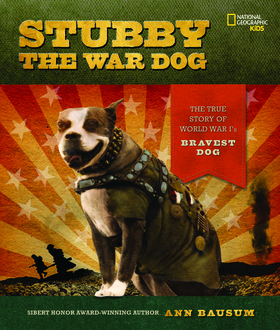 Choose Stubby the War Dog if you want to learn more details about Stubby, his friendship with Conroy, and the fame Stubby enjoyed after the war. This book was written for adults, but older students enjoy it, too.